I've tried reading Neil Stephanson a few times but could never get into it. I enjoyed Constantine. Love the picture of the Czech Republic. I've never been there, but I do have family from that area. WOW! Look at all your C's!!!! I thought my challenge was tough. You are amazing. Loved that Constantine. Thanks for all the C's. Great post. I love Constantine, just my kind of movie. Your post is really interesting and it has a bit of everything, I'll keep coming for more! From Diary of a Writer in Progress. Neat stuff - will be back. Wow! Love the simplicity of your posts--a gorgeous image for each post. Look forward to seeing D.
Ooh, Army of Darkness! I remember the Whatzamanomicron! Horst, Stephanson is not for everyone. He's super geeky and really does go on at length over geeky bits that most people find terribly boring. I happen to be a geek so I love his work! But he doesn't write endings. His books just sort of stop. It's weird. Wilma, I so wish I could have come to your blogger's wine & cheese (you may have noticed I like that combination. :P) but I had my last choir concert. Please do it again and keep me posted! 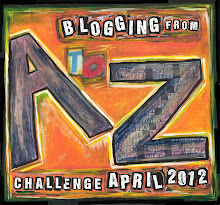 Hello, stopping by from A-Z Challenge!